From The Enigma Of The Apparent Age Of The Shroud Of Turin Given The 1988 Radiocarbon Dating by Jeffrey Skurka, P.E. (pictured). Nice Pic Dan! Perhaps you should also add Robert Villarreal, Mark Antonacci, and Robert Rucker to this photo. I can’t do that kind of editing. Jeffrey Skurka added his own picture. That was used in his presentation. It was great for laughs. I just love Jeffrey’s photographic montage (even if I disagree with his neutron activation theory)! No comments permitted yet I see on “The Conference is Over ” posting? Pity. 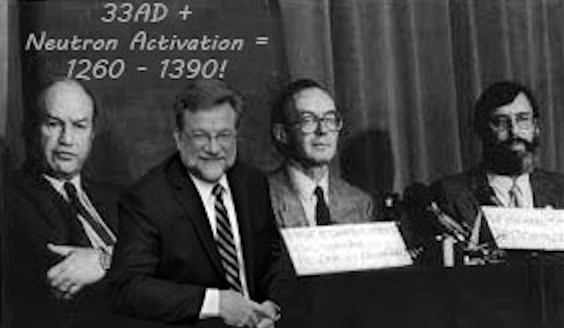 I wanted to know what Bob Rucker’s “MCNP analysis” was all about (apart from spontaneous emission of neutrons from RDVIPs (recently deceased VIPs) that handily converts N atoms of linen to C-14. MCNP? Manufacturing Curies Negates Patching? Yes, I was quite disappointed that I couldn’t make any comment on that posting. My wife was quite surprised that I had grown over four foot in a single night and did hope that Jack had credited her for the picture, taken in front of a door of our medieval parish church. I think the door behind me is medieval but there is no point in radio- carbon dating it as some later carpenter has probably invisibly mended it. I don’t subscribe to the neutron emissions hypothesis but I am still open to further investigation to prove or disprove it. Isn’t that what science is all about? (a) generate a superficial negative image? (b) make it seem 1400 years younger than it really is in radiocarbon dating? (c) is experimentally testable in principle? One suspects that (c) is the brick wall. How does one get a cadaver in a laboratory or elsewhere (rock tomb etc) to suddenly start spontaneously emitting neutrons? Before even trying to mimic the process, there is a huge obstacle to overcome and that is taking samples from the image area and ‘confirming’ that it dates “into the future”. It is entirely redundant to even try to replicate something like that unless the proof demands it. I would be amazed if the image dates “into the future” in the first place. No offense meant to Bob, but 7710 ±16 A.D. needs one hell of a leap of faith. I disagree, testing if the shroud was exposed to neutrons should not bundled up with fries and coke (image formation mechanism, trying to replicate the resurrection). It’s a simple test on its own that should demonstrate that the shroud was irradiated, period. If it proves positive then we can look into the possible reasons why? If the test was done according to a good protocol and performed according to the scientific method, proper controls, proper documentation, peer review, then why not. You can’t just flag anything you don’t like as pseudoscience and then perform your own kitchen experiments away from any protocol/proper documentation/controls/peer review and claim it’s proper science since you are doing it. Not quite, since there are claims that there should be a crescendo of C14 dates as you get closer to the core of the image, the best way to properly test the hypothesis is by testing several samples at different areas, including the image itself. Simply testing for past irradiation is half-assed. Since we are already way into speculative territory here, who is to say that the shroud could not have been irradiatiated in a separate event? What if the C14 remains the same in the image as in the other areas tested? I guess that it’s better safe than sorry, but at least I would prefer to have some proof of the concept *before* trying to figure out to even test it. * trying to figure out how to even test it (the hypothesis). Eric, the hypothesis is that the shroud at one point in time was irradiated. This can be tested by looking for radioactive atoms beside C14. If true then we can’t use C14 to date it, period. The hypothesis is that the irradiation of the shroud is responsible for the C14 date, past papers and the most recent abstract leave that clear. And my point remains that simply establishing that it was irradiated will not prove that the dates will fluctuate wildly as claimed, the only way to prove that conclusively is by actually testing the C14 of different areas. Eric, I wasn’t talking about the paper. If you scroll up you will read that I don’t subscribe to neutron irradiation as an image formation mechanism, but would be fine with testing the possibility that the shroud was irradiated at one point in time. If yes then we cant carbon date it, if wrong then we should be able to carbon date a representative sample of the shroud. What’s wrong with such an investigation? Nothing, if it were timely and relevant to what is being discussed here. “When Bob Rucker finished his extended talk, MCNP Analysis Of Neutrons Released From Jesus’ Body In The Resurrection the applause was seismic. In closing, he mentioned that he had a few handouts of his slides. They were gone in 15 seconds as people all but climbed over tables to grab them. I was approached by several people to see if I would publish his PowerPoint now because nobody wanted to wait until the conference papers were published, probably in December. So what caused all the excitement? It certainly wasn’t the idea that the TS had at some stage merely been exposed to neutron radiation. It was the source of that radiation (“released from Jesus’s body”) which I feel bound to say is deeply problematical for some of us who know a little about stable and unstable nuclides. To Rucker’s credit he has made predictions, quite extraordinary and daring ones, ones that Eric has flagged up before me, namely the expectation of there being a superabundance of C-14 in core regions of the TS that would date it into the future! Sorry, MikeM, but your minimalist approach for testing so heroic a Resurrection model may fit your bill but simply does not rise to the occasion. I’m ignoring your tail-end observations regarding my own humble researches. If you have questions/criticisms re particular claims or the methodology/documentation employed I may respond. There is nothing “wrong” with pursuing this line of investigation. It is the confirmation bias that bugs me. Let’s say that some past irradiation is found… That by itself will *not* prove the supposed effect on the C14 dates. However, due to that confirmation bias the hypothesis will be wrongly promoted as “confirmed” in all of its components, not only the irradiation of the shroud. The media will begin a crapfest of speculation (likely published on Easter, to boost) that all future research will be forced to deal with. Any scientist that is skeptic of the shroud’s authenticity will be regarded as working against the “established wisdom” based on incomplete research. That would remain the status quo until new C14 testing is allowed. No… I’d rather have it the other way around. Since the confirmation of the hypothesis depends entirely on the presence of a wild variation of C14 dates, why not start there? Why not avoid the complementary irradiation investigations (and all of its possible consequences) until we have some basic support for the hypothesis? I had been in contact with Jack Markwardt last August. Discussion on this site at the time had dwelt on his earlier papers concerning Antioch and the Shroud, and I thought he might be interested in following the thread. He had graciously mentioned to me the intent of his St Louis paper, which I gather was quite ground-breaking in terms of his new hypothesis. He intended it as an alternative to Wilson’s Mandylion theory. He had apparently become dissatisfied with the Mandylion theory following publication of Mark Guscin’s “Image of Edessa” book in 2009, and again in 2010 when Wilson published his book that year. There seemed to be a number of aspects which he felt could not be satisfactorily explained or resolved. He felt that he had arrived at a satisfactory alternative scenario. I shall look forward to reading it in due course when the conference papers emerge on site. No doubt we shall see some interesting discussions involving the usual contending participants. "Just the facts, ma’am." Is the Shroud Evidence for God’s Existence?